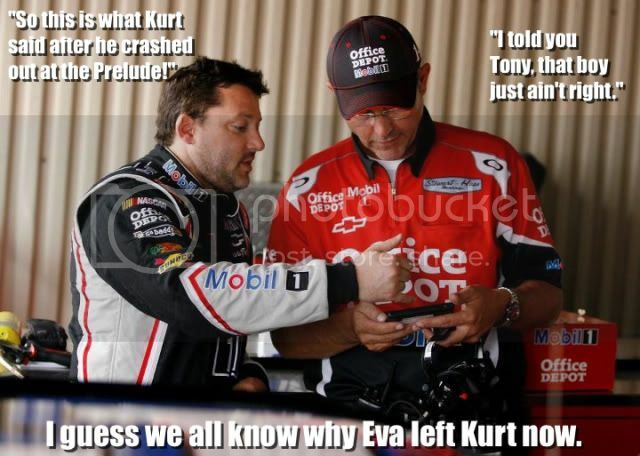 Tony Stewart, Second favorite is Trevor Bayne. Hey man, you liked the video huh? I apppreciate it if you do! Well if you want more of those, I can show you more to come! Racetrack philosophy: A guy at the local dragstrip where my grandpa races said this concerning man's desire to go faster. " People will not stop trying to go faster until they build a car with such violent acceleration it causes instantaneous death when you get on the throttle." So classic! That's pretty cool. You planning on going to next years Daytona 500? Cause I'm getting tickets way in advance, so I get seats for the 500. Hey buddy, how's it going? Going to any races this season?